It was Matt Harvey’s game to lose. He came, he pitched, and he hit. The Cubs knew going into this who they were dealing with. Harvey hadn’t lost a game all season and pitched a one-hitter just a week and a half ago. Just as expected, he was solid, but so was Edwin Jackson and before we knew it, we had a game. David Wright lit up the first with a leftfield seat-reacher, his sixth on the year. In the bottom of that same inning, Starlin Castro scored on an infield single from Alfonso Soriano. Ruben Tejada was charged with a throwing error to first, leading Anthony Rizzo to score as well. Cubs were up 2-1, but after that Harvey would retire all but two remaining batters that faced him. It was clear that both pitchers had found their rhythm. Yet, Jackson allowed another solo homer, this time to Daniel Murphy (3). Before you knew it, he made it through six, pitch count still calm. After Rick Ankiel reached second off what may or may not have been a catchable fly to Schierholtz, bearing the sun, Matt Harvey took things into his own hands. He singled to left, plating Ankiel, the would-be winning run. Chicago made a go of it in the eighth, though, with a Barney leadoff bloop hit. He advanced on a perfect third base side bunt by Julio Borbon and then David DeJesus would single off of reliever Scott Rice. What everyone thought to be an easy tying run turned into Barney being caught, by a mile, after Marlin Byrd threw a rocket to home. 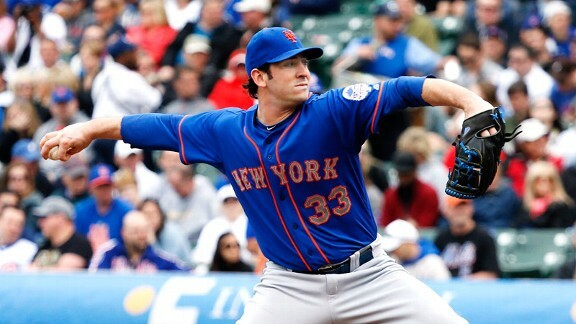 Matt Harvey showed up and won, with the winning RBI. It was his 5th win of the year as he pitched seven and a third, allowing 5 hits, 2 runs and fanning 6. Bobby Parnell would get the save (5) for New York. Jackson took the loss, it would be his 6th. However, it was his most promising start of the season as he pitched six and two-thirds, allowed 3 runs on 7 hits and 1 walk, while striking out 4. Tomorrow we’ll see Jeremy Hefner (0-4, 4.61) facing Scott Feldman (3-3, 2.53) for a 12:05pm start.